Oxidative stress due to imbalance between ROS production and detoxification plays a pivotal role in determining cell fate. In response to the excessive ROS, apoptotic signaling pathway is activated to promote normal cell death. 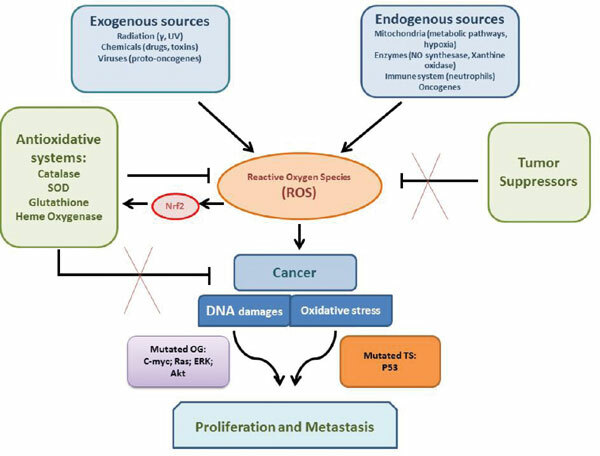 However, through deregulation of biomolecules, high amount of ROS promotes carcinogenesis in cells with defective signaling factors. In this line, NRF2 appears to be as a master regulator, which protects cells from oxidative and electrophilic stress. Nrf2 is an intracellular transcription factor that regulates the expression of a number of genes to encode anti-oxidative enzymes, detoxifying factors, anti-apoptotic proteins and drug transporters. Under normal condition, Nrf2 is commonly degraded in cytoplasm by interaction with Keap1 inhibitor as an adaptor for ubiquitination factors. However, high amount of ROS activates tyrosine kinases to dissociate Nrf2: Keap1 complex, nuclear import of Nrf2 and coordinated activation of cytoprotective gene expression. Nevertheless, deregulation of Nrf2 and/or Keap1 due to mutation and activated upstream oncogenes is associated with nuclear accumulation and constitutive activation of Nrf2 to protect cells from apoptosis and induce proliferation, metastasis and chemoresistance. Owning to the interplay of ROS and Nrf2 signaling pathways with carcinogenesis, Nrf2 modulation seems to be important in the personalization of cancer therapy. Antioxidant, Cancer, Keap1, Nrf2, ROS, Oxidative stress.